Ltd., Konohana-ku, Osaka, Japan; 3EEN Co., Ltd., Bunkyo-ku, Tokyo, Japan. of plant biomass waste has been discharged in the world. peratures, compared to those of native HEWL [9-11]. obtained from Nichi-Iko Pharmaceutical Co. Ltd.
pared on a carbon tape without vapor deposition. pore system (BELSORP-mini II, BEL JAPAN, INC.). with a membrane filter (pore size: 0.1 μm, Millipore Co.
measurements with a standard error less than 10%. 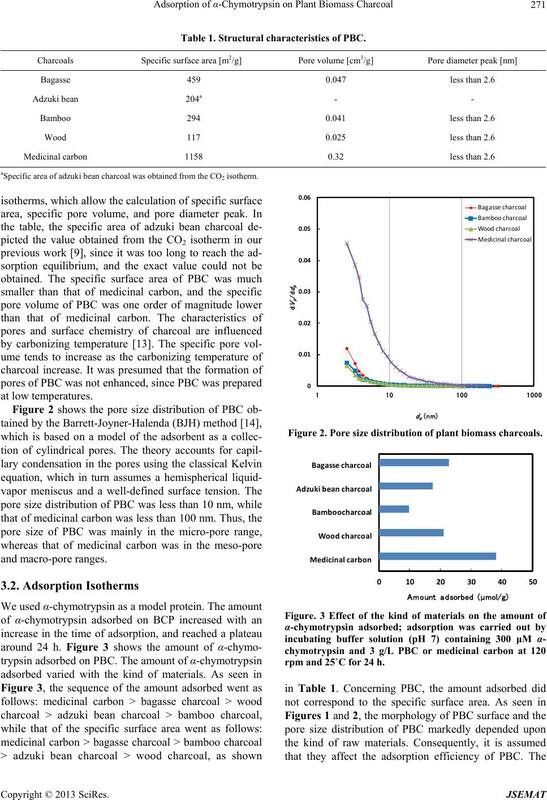 carbon is shown as typical activated carbon in Figure 1.
charcoal was produced under 600˚C by a charcoal kiln. and many pores were observed on the surface. Table 1. Structural characteristics of PBC. aSpecific area of adzuki bean charcoal was obtained from the CO2 isotherm. Figure 2. 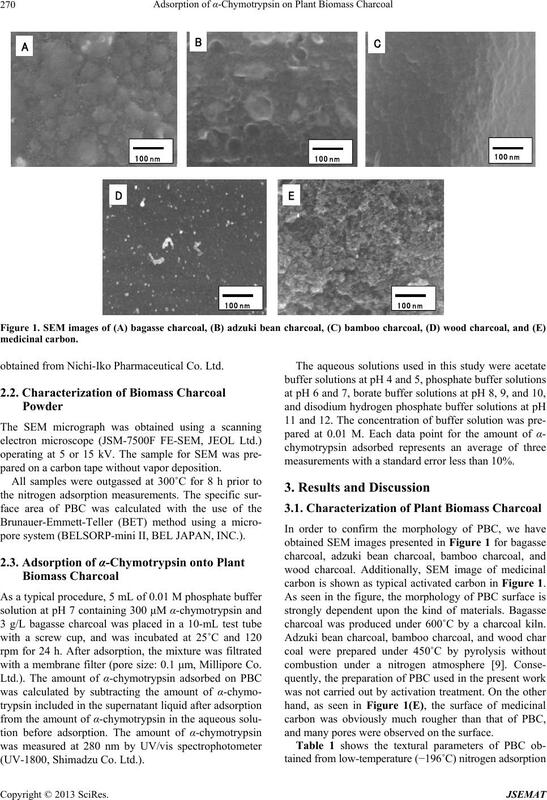 Pore size distribution of plant biomass charcoals. rpm and 25˚C for 24 h.
motrypsin on adzuki bean charcoal and bagasse charcoal. perimental data using Equation (1). coal is more effective than that on adzuki bean charcoal. 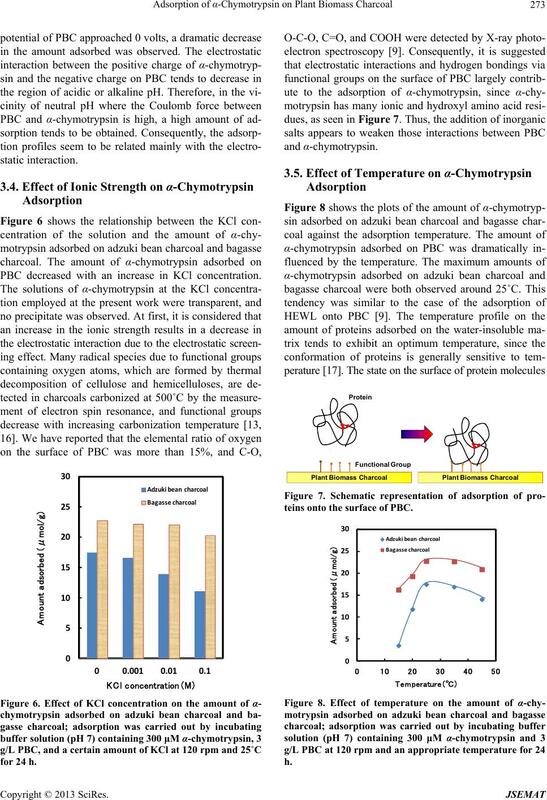 PBC at 120 rpm and 25˚C for 24 h.
PBC decreased with an increase in KCl concentration. teins onto the surface of PBC. kedly affected the amount adsorbed. 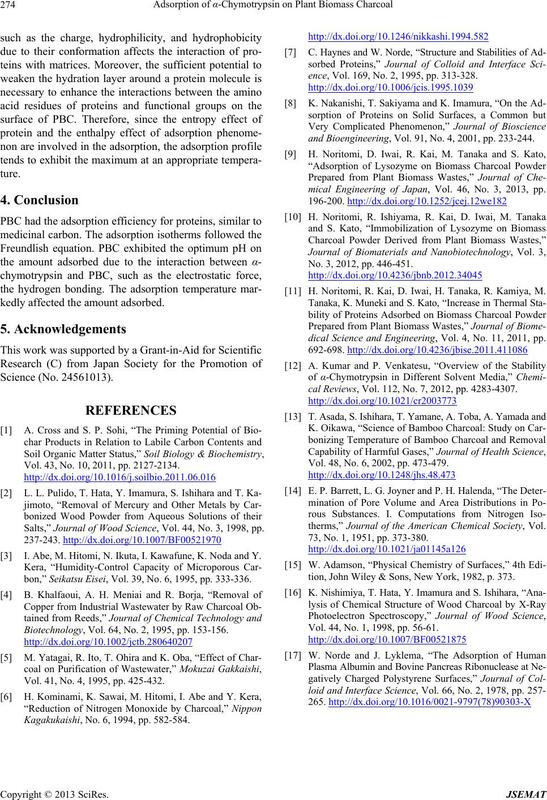 Salts,” Journal of Wood Science, Vol. 44, No. 3, 1998, pp. I. Abe, M. Hitomi, N. Ikuta, I. Kawafune, K. Noda and Y.
bon,” Seikatsu Eisei, Vol. 39, No. 6, 1995, pp. 333-336. Biotechnology, Vol. 64, No. 2, 1995, pp. 153-156. Vol. 41, No. 4, 1995, pp. 425-432. Kagakukaishi, No. 6, 1994, pp. 582-584.
ence, Vol. 169, No. 2, 1995, pp. 313-328.
and Bioengineering, Vol. 91, No. 4, 2001, pp. 233-244.
mical Engineering of Japan, Vol. 46, No. 3, 2013, pp. No. 3, 2012, pp. 446-451. 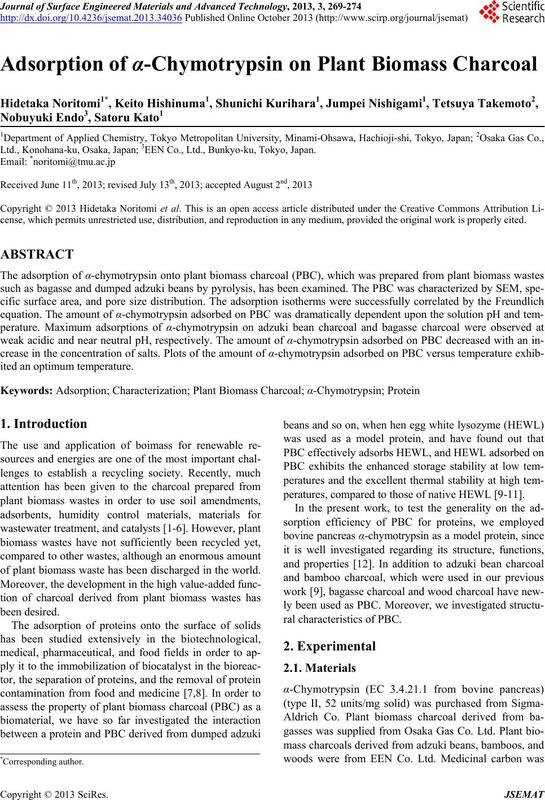 H. Noritomi, R. Kai, D. Iwai, H. Tanaka, R. Kamiya, M.
dical Science and Engineering, Vol. 4, No. 11, 2011, pp. cal Reviews, Vol. 112, No. 7, 2012, pp. 4283-4307. Vol. 48, No. 6, 2002, pp. 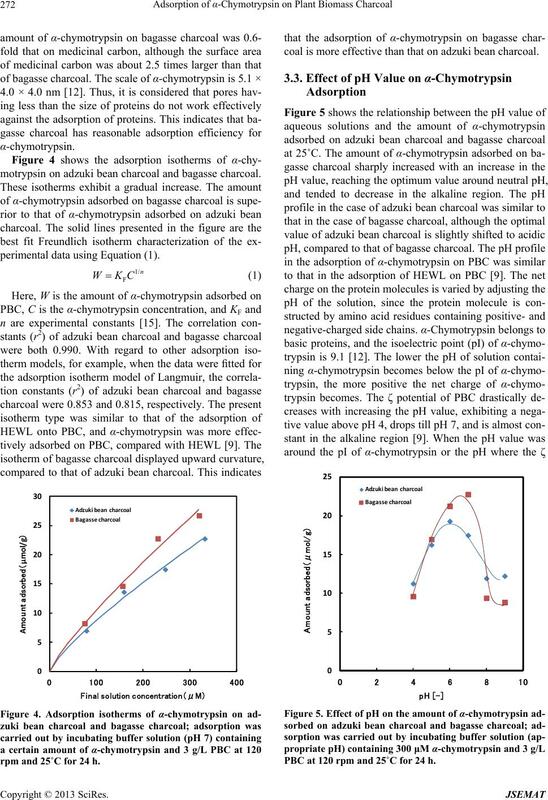 473-479.
therms,” Journal of the American Chemical Society, Vol. 73, No. 1, 1951, pp. 373-380.
tion, John Wiley & Sons, New York, 1982, p. 373. Vol. 44, No. 1, 1998, pp. 56-61.